With the ground still being frosty I have decided to start my shallots and garlic off under cover. I found myself some windowsill propagators for £2 each at B&Q, with a bit of scissor work I’ve managed to squeeze enough cells in each one. They have a clear plastic lid each, so I will be able to sit these on the windowsills around the house whilst its cold but sunny outside. The sun through the windows should give enough light to get them growing. This should give the bulbs a head start and also give me the opportunity to dig over the ground once more before putting them into their final positions. I’m growing ‘Garlic Solent’ and ‘Shallot Longor’ this year, I’ve not grown either before so it will be nice to see how well these do. 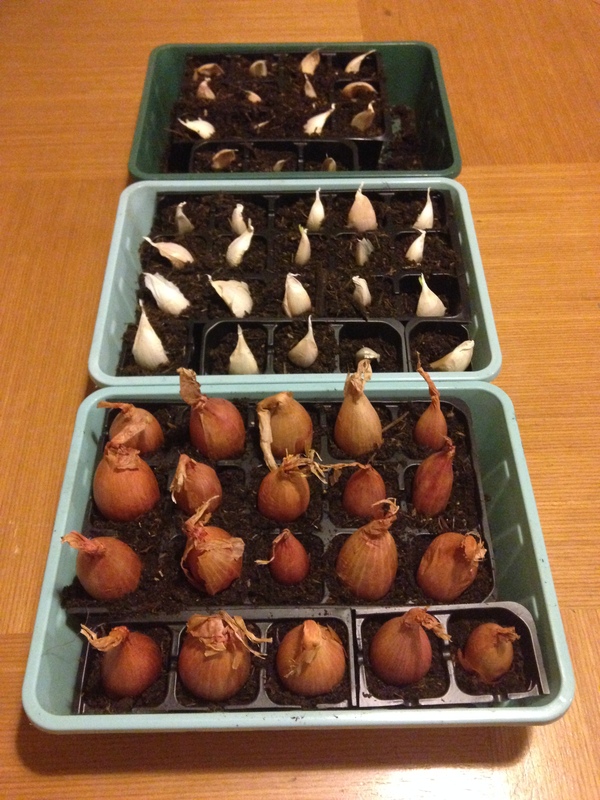 I’ve never grown garlic or shallots….. you may well have inspired me here! We do eat a LOT of garlic!